When life gives you cracked eggs, what do you do? 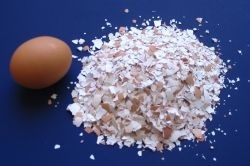 Make egg shell fertilizer! We sell clean dry crushed egg shells as an excellent garden fertilizer in 3 lb bags right here at the farm. This natural, slow-releasing organic source of calcium carbonate is great on heavy feeding perennials and vegetable plants like tomatoes and sweet peppers. Each bag contains over 350 eggs shells (that's a lot of eggs, trust us!) and sells for $12.50 per bag. Need a lot of natural fertilizer for your organic garden? Contact us; we'll make bigger bags for you! Please click here to make an order or ask a question.